Martine Ehrenclou began to write The Take-Charge Patient: How You Can Get the Best Medical Care after spending time at a hospital with sick loved ones and seeing, she said, the difference in medical care experienced by those who advocated for themselves and those who did not. Then, six months into researching the topic, she developed debilitating—and seemingly undiagnosable—chronic pelvic pain and faced the challenge of having to advocate for herself. Divided into short, straightforward chapters, The Take-Charge Patient covers everything from understanding the doctor-patient relationship and getting the most out of each doctor visit to preventing medical errors and differentiating between types of procedures and care providers. Starting each section and woven in throughout are valuable first-person stories and advice shared by the more than two hundred patients and health professionals (including surgeons, family practitioners, registered nurses, medical assistants, and clinical professors) Ehrenclou interviewed. Similar to her first book, Critical Conditions: The Essential Hospital Guide to Get Your Loved One Out Alive, Ehrenclou has written The Take-Charge Patient with the kind of authority and know-how that only someone who has experienced these challenges firsthand can achieve. The information is thorough, the tone comforting, and Ehrenclou’s straightforward suggestions make even the most daunting tasks—such as telling a longtime doctor you want a second opinion—seem doable. At the end of each chapter is a Patient Checklist, as well as bulleted lists of resources and, when appropriate, suggested follow-up questions. The last chapter is dedicated to the importance of being proactive and completing legal advance directive forms such as a living will and durable power for attorney for healthcare, which state what kind of life-prolonging medical care you want to receive if you become unable to make your own decisions, as well as who you want to make medical decisions on your behalf. The appendix includes helpful definitions of medical professionals, tests, and health insurance terms that, like the rest of the book, are written simply, making complex medical information easy to understand. 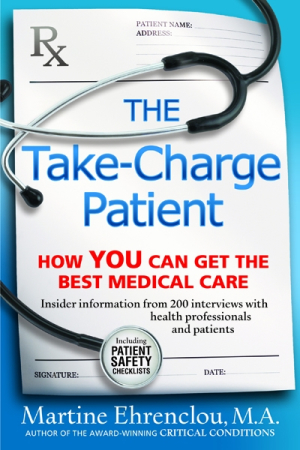 For anyone facing a complex diagnosis or condition in today’s increasingly complicated medical world, The Take-Charge Patient is a valuable tool and guide with sound advice that won’t soon be outdated.